Hey TCK Life Reader! I need your help! If you’ve read recently, you know I’m converting Third Culture Kid Life into a book called Third Culture Kid Life: Twenty Something where I’m publishing every single article in this collection written throughout my twenties and then writing a follow-up “looking back” segment at the end talking about my thoughts on that piece today. It has been a blast so far reading the work and responding in a way I’ve never done before, and as of today I’m just shy of 30 chapters of 50. Now, I need your help! Below you’ll find two cover options. I need you to vote and tell me what your favourite is. I’m struggling between a graphical look and a photographic look. 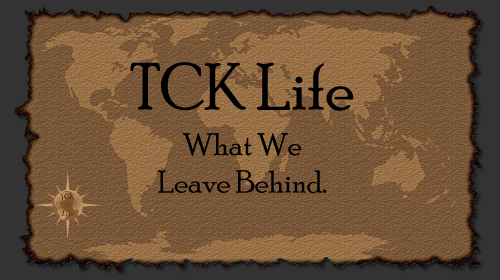 I want you to let me know, as readers of TCK Life, which one represents the life and mind of a TCK the best. I appreciate your help, and it means a lot! To satisfy any potential curiosity: yes, that’s a picture of my brother and me. 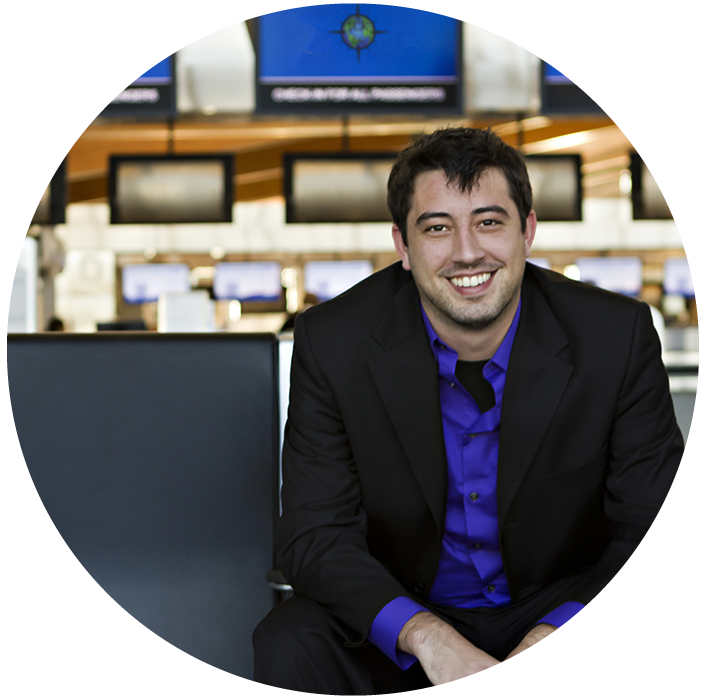 This entry was posted in Adult TCK and tagged Adult TCK, expat, expat book, expatriate, TCK, TCK book, Third Culture Kid on February 20, 2017 by James R. Mitchener. I’ve been writing for TCKs for a decade now, and during that time I have watched the global trend of globalized thought shift to an incredibly positive outlook on humanity as a whole. I have been full of pride in my interactions with so many FCKs who have grown up from generations built on oppression who have opened their minds to a more unified way of thinking, embracing the necessity of innovation and adaptation to provide an avenue for a world in which we as humans are stronger because of an inherent desire to embrace difference rather than fear and oppress it. As a global nomad, the past week has been incredibly hard for me. I’m sure it has been hard for many TCKs, honestly. The TCK community I have most contact with seems to be reflecting that sentiment heavily, but you might be different to the majority. If so, I respect that, and I humbly invite you to tell me why, as a TCK and global nomad, the past week has not been troubling for you. First, I’m coming back. 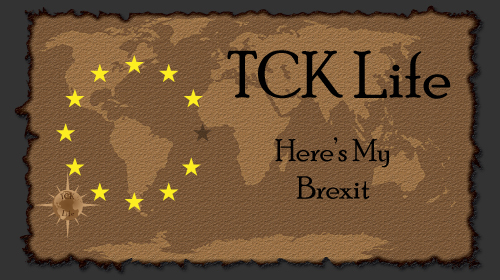 I’ve been gone too often lately pouring my time into my work and neglecting this arena built to encourage globalized thought and provide information for TCKs and the families and friends of TCKs alike by opening up insight into the inner workings of a TCK mind. This place was created as a safe space where you could ask me anything you wanted about being a TCK and not having a home or knowing where I belong, and my absence has gone on long enough. This past week has made me realize more than ever that something we need right now as people who live by globalization is a safe space. Third Culture Kid Life has been an avenue for dialogue and information sharing since its inception, and it’s time I bring that back. Second, I want to promise you that I will not censor my words for fear of oppression, hatred, or any other reason. I do not like being political, I quite often find a significant amount of cross-party understanding in my views, and I am capable of drawing good from bad in most instances. But what the world is facing now, even if you aren’t living in America or have a passport from this country, is a leader who does not care about minorities, globalization, foreign policy, and worst of all, open communication. Censorship is already rampant, fueled by the office of the president, in a country that is supposed to be free. So, while I do not enjoy being political here, this isn’t about politics anymore. This is about the future of globalization and the core values that I, as a Third Culture Kid, believe in. And this collection, after all, is about the mind of one particular TCK. This TCK wants you to know what it looks like to him as the world he has dreamt of, one he slowly watched form over the years despite so many struggles and hardships, gets stripped away. Third, I want to encourage you to use your voice for reason based on facts, not fiction. It is clear now, only a week into the next four years, that scientific thought and reason are no longer welcome in this country. The quest for knowledge was challenged constantly during the campaigns by the same man now sitting in the white house, and those challenges are now being put to extreme use. More than ever, you need to use your freedom to speak, and you need to use it with a basis of fact, reason, and logic. In a week, we have seen government agencies put in place for the benefit of the people be told they can no longer communicate with the public, that they cannot communicate with the press, and they cannot publish any scientific data without getting the approval of the white house who has no right or ability to vet the quality of that research. This collection was designed to give TCKs without a home three things. First, a space where someone would tell them things that would hopefully make them see that the experiences they are struggling with aren’t just normal for a TCK, they are struggles that will one day become sources of empowerment. Second, an avenue for you to openly communicate with a TCK who will hold nothing back from you, answering any questions you want without bias. And third, a place of understanding for your friends and family to help you explain what it’s like to be you without requiring you to open yourself up in the capacity I have chosen to do. This collection was built to bring people together. And today, as I feel myself becoming increasingly overcome with grief and concern for my love of this world, the people in it, and the pursuit of knowledge to better serve everyone on this planet, I am reminded heavily why I started writing here. I wanted to bring us together in my small way to support a global thought process. I wanted to do my part to make a better world for you. And no matter what happens going forward, I will not stop voicing my unwavering desire to build that world. More than anything, I want you to know that I’m here for you, no matter what. This entry was posted in TCK Thoughts and tagged Adult TCK, Adult TCKs, Culture, expat, expatriate, TCK, TCKs, Third Culture Kid, Third Culture Kids on January 27, 2017 by James R. Mitchener. I’m turning 30 soon. This month, in fact. It doesn’t really mean anything to me personally. It’s just another rotation around the sun I’ve experienced, tallying 30. Well, actually, thanks to the Gregorian calendar not being entirely accurate, it’s probably going to be a little more than 30 years if you were to average out all the added seconds and minutes we’ve received. Or is it less? I don’t remember, I did the math once on how the past 30 years relative to me based on additions, subtractions, and alterations compounded by the incorrect value of a year impacted my time on earth in rotations around the sun, but I have no memory of the outcome. I probably did the math wrong too if we’re honest. But that’s not the point, As usual, I’ve digressed. The point is, I had an idea. I’ve been writing this collection and The Illusive Home for a decade now. Granted, The Illusive Home is done, but it was the start of this, the realization that I was never done writing about the perspective of a TCK as he progressed through his life. So, like I said, I had an idea, one that I’ve been working on for a while now that I’m hoping to have completed just as I turn 30. I’m turning the past decade’s worth of work into a book. 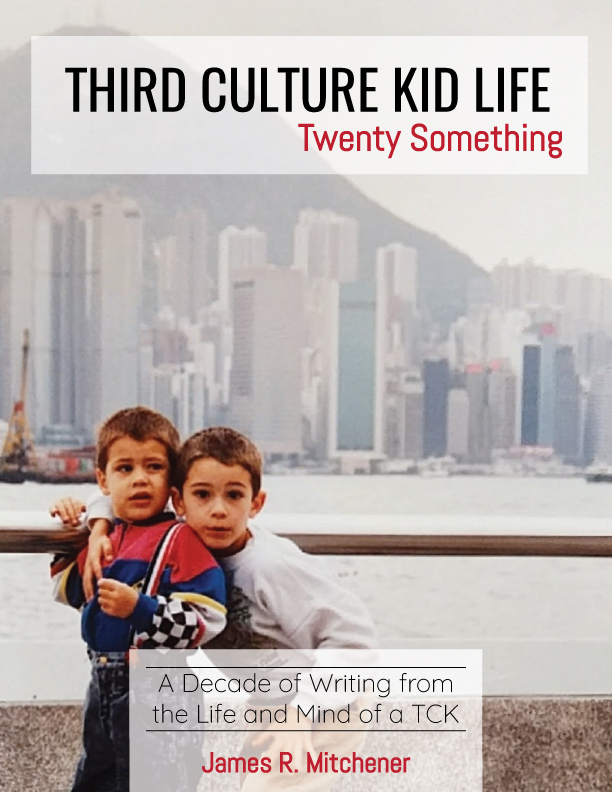 That’s right, TCK Life, the digital collection, is going to become Third Culture Kid Life: Twenty Something. The objective is to take everything I wrote in my 20s and publish it as one cohesive collection, starting from the beginning and working to today. But that’s not all, because then I’d just be printing the internet and there’s no point in doing that. So, I’ve made some additions. I’ve always said on here I’m not going to explain myself for my words. I’ll offer guidance, but if you draw a theme or an idea that’s yours. It helps you connect to the experiences if you do it that way. But there’s a lot of depth behind some of these pieces I’ve written that you don’t know all the details for. So, for every piece that ends up in the book, it’ll be followed with an explanation of the moment, looking back, from me. 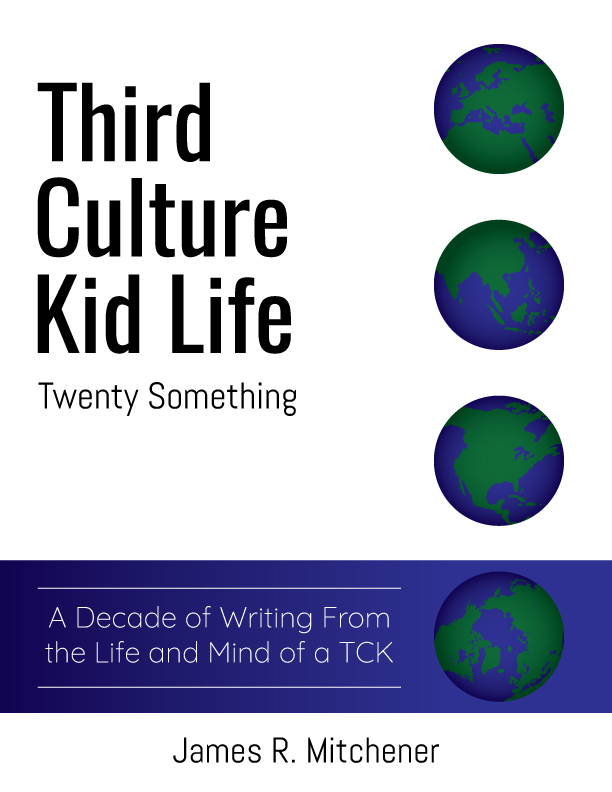 Each article you’ve read on TCK Life will have the look-back of a man at the end of his 20s, transitioning into another decade of TCK Life writing, and see what I think of these words, these experiences, today. Some of them will be looking as far back as 9 years ago. Others, will be looking back to this year. I’ve already written some of these and I have to say I’ve enjoyed it. It’s neat looking back at the things I used to talk about, worry about, the problems I was facing at the time, and how they shaped me into the person writing now. But what’s most exciting is how that shapes this collection. Third Culture Kid Life has always been about showing you what a TCK thinks and feels from the perspective of me. I’m just one in the field of many, and while I use central themes to the TCK experience, I leverage my personal experiences to inform other TCKs that they’re not alone in the roller coaster of adult TCK life they’re experiencing. More importantly, parents of existing and developing TCKs are a large chunk of my readership. Reading where I am now, and what I think of the past comments as I stand today might offer even further insight into the expectations of the TCK their developing, and that could be really helpful. So, I wanted to let you know it was coming, and that I’m not done here. We’re about to start a whole new decade of my life, which means you’re going to get writings about what it’s like from a 30 something TCK as well. I don’t feel any different personally, but looking back, a lot has changed. And that, to me, is quite exciting. I’ll also be writing a book exclusive article that’s about the end of my 20s and a summary of my life as a TCK so far, which will talk about changes in the world, changes in myself, and how I’ve seen myself evolve as a TCK over the years in reflection. Also, there’s an introduction that’s entirely unique, so there’s quite a bit of new content for my supporting readers looking to add the book to their bookshelf. Thank you for all your support, and I’ll update this page with links as soon as the book is available. Oh, it’ll be both digital and paperback, so you pick if you’re interested. UPDATE: January 10, 2017 – So, it turns out this is going to be a longer project than expected, which is great news for my readers! My “Looking Back” portions as I’ve decided to name them are ending up as long as the articles themselves, in many cases longer. I’m also doing them on ever single piece, so we’re looking at double the content of what you’ve read so far, with every single article you’ve read here having its own “Looking Back” accompanying article about how I view that event, perception, or experience today. This entry was posted in Adult TCK and tagged Adult TCK, expat, expatriate, TCK, TCK book, Third Culture Kid on January 5, 2017 by James R. Mitchener. Leaving our lives behind is a concept that is inherent in every single Third Culture Kid’s upbringing. As far as foundations are concerned, the idea that a departure is always imminent is probably the strongest baseline you can find in the highly jumbled subcultures of TCKs from around the world. TCKs share very little when it comes to the cultural developments that made them, but they are all so close in the foundations that built them into the people they became. They are built out of leaving their lives behind, built of loss, adoption, and absorption. Of starting again, and applying the lessons learned of the past to new and interesting cultures that surround them. And their ability to adapt, to bounce back from loss and create something new from the rubble of their previous lives is all because they started this journey learning that loss is always more than probably, it is inevitable. Human kind lives in a world where society is still highly pocketed. Cultures exist within cultures, and many of those cultures rely and thrive on a degree of isolation. People cross cultural boarders more so than ever before, but in reality these borders still exist within the confines of an isolated and highly compartmentalized social and developmental structure. The world is getting smaller, but the rate of cultural adaptation hasn’t kept pace with humanity’s abilities to blur the lines within the cultures we inherit. That is, with exception to those that have been thrust, most unwillingly, into the Third Culture. The Third Culture is the closest we have come to defining human kind’s ability to embrace cultural adaptation. It starts with a core self identity crisis, in which a Third Culture Kid hits a wall in their lives where they suddenly realize that they are no longer truly a member of the culture of their parents’ culture. For some, this wall is mountainous to overcome. For others, it’s a small hurdle cleared with ease. But that realization hits every TCK at some point in their lives, and from that moment forward they will be tasked with the endless struggle of finding what it is that makes up their cultural identity. From here, a TCK picks and chooses the pieces of his or her life that hold the most value to who they think they are. A little bit of culture “A,” a lot of culture “B,” and a dash of culture “C” all lends to the creation of a person who can transcend any culture they’ve touched, make themselves part of it, make themselves welcome and comfortable, but never truly becoming a completely interwoven part of the culture itself. This picking and choosing allows for the cross pollination of cultural ideas from a party that the impacted culture can trust, while offering a sponge of cultural absorption in the TCK who will carry the elements of the culture they’re interacting with onto every culture that follows. The TCKs lack of ability to truly be indoctrinated by any one culture means that they will always be on the move, always looking for new pieces of the puzzle of self identity. This is the drive for forward momentum, like seeds being spread across a field in the wind. 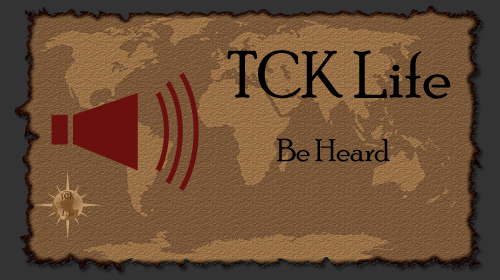 Everywhere a TCK goes, they evolve, become different, absorb new cultural elements. Then, when they leave, they leave behind a piece of so many cultures that will be absorbed into the culture they have departed, and the TCK takes with them even more cultural quirks to spread into the next culture they encounter. The first and most brutal is a complete cultural reversal. Inspired by mass extinction events of the past in which entire species are wiped out, we are looking at a potential Cultural Shut-down. Any large event, a World War, a technological hiccup that shoots us back in time through our ability as a species to harness technology, will distance us from one another once again and strengthen our ties to individual cultures, making cross pollination of cultures unnecessary and unwanted. The second, and hopefully more likely, is Cultural Survival through Evolution. Globalization comes at a price. It unifies ideas, people, and minds. And at the same time, it forces the segregation of independent cultural norms that we accept in our current societal state. As the ability to travel comes ever simpler, as cultures rely more heavily on each other to prosper and survive, cultural blending will become absolutely inevitable. Language barriers will collapse. Food sources will be shared. Trade will increase. Boarders will weaken. And in that process, cultures will be mixed more heavily with one another unlike ever before in human history, fuelled by technology that was unimaginable in the days of isolated cultures. This transition is happening now, only in its infancy, and that infancy lives within TCKs everywhere. TCKs are the signs of a world to come in which culture isn’t about isolation, but rather the sharing of ideas and theories. Many cultures will, albeit sadly, fade away into oblivion with countless millions of forgotten cultures before them. But in the end, we will have a more global society built upon the best pieces of the cultures we experience now. That transition is many years away. Centuries, perhaps. But if the rapid growth of TCKs shows us anything, it’s that their self identity in culture, the adaptability of human kind, is the gift that they will leave behind for the generations that follow. TCKs are paving the way for a future that they will never live to see. But the future of our species depends on cultural adaptation, and TCKs are already doing something that has never been done before. They’re growing in numbers, and manipulating cultures in a world that has the technology and power to experience the difference adaptability makes in its every corner. And that adaptability will be the idea that carries our species forward into a world of true globalization. It will be the gift that every Third Culture Kid will leave behind, for the generations that follow. This entry was posted in Cultural Identiy and tagged cultural adaptation, Cultural Identity, Culture, TCK, TCKs, Third Culture, Third Culture Kid, Third Culture Kids, Travel, World Culture, World Travel on June 17, 2015 by James R. Mitchener. I challenge you to find a Third Culture Kid (TCK) out there who doesn’t agree with this statement: The internet is the purest and most openly accessible form of connection between cultures currently in existence, the single exception being one’s ability to walk into a country and immerse themselves in the culture they’re surrounded by. With talks of Net Neutrality sky-rocketing again in the United States (I say sky-rocketing with full knowledge that while there are many people making a lot of noise on the issue, there are far too few given the fact that the internet is a vital part of almost everyone’s lives), the fact that we may very well lose a free and open internet is becoming a topic of concern for anyone living in this country. For the general public and life-long residents of the US, a free and open internet represents a connection to free speech and expression coupled with a gateway to free market enterprise. The internet is home to everything now, and with that complete involvement in our lives, we find ourselves turning to it in order to acquire information, purchase anything we want, connect with friends and loved ones, start a business, get our name heard, learn new things, relax and unwind, watch television, follow rising stars, listen to music, find new friends, develop contacts, apply for jobs, work our jobs, and ultimately: connect ourselves to the world. For America, one’s ability to start a company and rise to success has been the driving force of free market enterprise, and with the creation of the internet, that drive has never been stronger. People with highly marketable skills in isolated industries now have a portal of access that allows them to get their name into the world, to create a company that focusses on something unique and desired, and share it across a digital path that spans the entire expanse of our planet. And we do it all under the guise that our information is created equally, no matter what information we choose to share. It turns out that when you allow a company to have a monopoly on an asset, they will often abuse the power of possessing that monopoly for profitable gain. It is foolish for us to blame them for this, as it is a natural part of running a business, but you also have to remember that one of the core values of the free market is that competition is fundamentally good for business. ISPs will argue all day that they do not have a monopoly, but their arguments are nothing short of propaganda that permeates the most hated industry by customers in the nation. In truth, they don’t have a monopoly in most markets. But their lack of competition based on mutual gain might as well be. I’m not a fan of regulation. I don’t like governments at all and honestly believe them to be incredibly inefficient, money sucking machines driven by idiots, crooks, and thieves. But, unfortunately, there are exceptions to every rule, and while I am a free market person to my core, I am not foolish enough to believe that with ISPs being the same people that want us to watch cable television and buy premium shows, that they’re not going to bully us into them getting what they want. We’ve already entered into a slippery slope of being charged twice for access to an internet we never really recieved in the first place. And if you don’t agree with that, perhaps you forgot about Netflix and Comcast‘s spat earlier this year? The thing is, as a TCK, the internet is more to me than just a tool for domestic business. Granted, I use it every single day for just that being the Marketing Manager for a rather prominent waste company, authoring this collection, and managing various other private contract roles with different organizations. But it’s bigger than that. It’s a point of connection, and my ability to do those things is driven by a free and open internet in which my traffic is just as valuable as anyone else’s in the eyes of neutrality, and it’s the consumer who decides my worth, not an ISP. And this is bigger than you think. Hundreds of massive companies, including Google and Netflix have already sided with Net Neutrality advocates everywhere. And that’s a big deal if you think about it. People who yell “Well of course they don’t want to be forced to pay more to have people access their information, they’re giants” are missing the point. It’s true, they don’t want to pay, why would they? It hurts their bottom line. But the point is, if they have to pay, they can. That’s the thing you need to be asking yourself here. Can you afford to pay to get your name heard because an ISP has decided your content is taking too much traffic? Take me, for example. 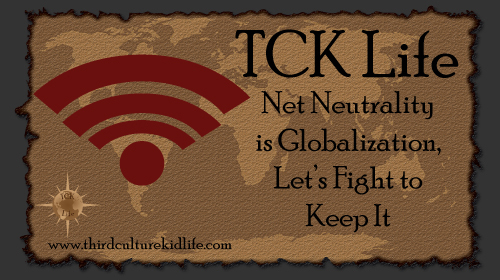 I host a completely free resource of information here at Third Culture Kid Life for TCKs, their parents, their families, and their friends. Over the past three years, it has become quite a trafficked site. I know that if ISPs get their way, they won’t bother with the likes of me right off the bat. But one day, they might. And if they do, what would happen? Unfortunately for me, and hopefully my readers feel the same, Third Culture Kid Life would be no more. My content could be inaccessible all because I didn’t pay an ISP to get a pass-through to my website so that people could load my page. And with the content of the world at my fingertips, that entire concept is absolutely terrifying. So please, while you still can: Take a stand. Fight for a free and open internet. Fight for Net Neutrality. Let’s keep the culture of the world, and the culture of the internet that connects it, as strong as it has always been. This entry was posted in TCK Thoughts and tagged Culture, expat, expatriate, FCC, free and open internet, internet, Net Neutrality, TCK, TCKs, Third Culture Kid, Third Culture Kid Life, Third Culture Kids, World Culture on November 14, 2014 by James R. Mitchener.